1) Chef Mario Batali holds a Q&A with NYU Stern Professor Russell Winer. 2) Eataly CFO Adam Saper talks with NYU Stern marketing students about running New York City’s most popular “living market”. 3) Mr. Batali and Professor Winer chat with students before class. 4) Mr. Batali draws a packed Stern class for a discussion on restaurants, the food business and how Eataly found success. In business, the best of times often come straight out of the worst of times. That’s the story behind the Flatiron District’s Eataly; in just six years, born in the wake of the Great Recession, the 23rd Street market has gone from a gamble at a precarious time to one of Manhattan’s most popular attractions. 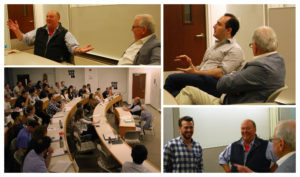 On April 19th, sections of Stern Professor Russell Winer’s marketing class had the opportunity to hear just how Eataly ticks directly from CFO of Eataly USA, Adam Saper, and his business partner, and culinary star, Mario Batali. The two entrepreneurs each spent ninety minutes talking about Eataly’s truly unique qualities—from the store’s principal shop-eat-learn philosophy and how it establishes partnerships with unique, small, Italian producers to how the company approaches developing talented employees. And while both Saper and Batali visibly beamed about Eataly’s accomplishments, they also discussed just how nerve-wracking it is to stake a claim in food industry—in which seven out of ten restaurants go belly up—even when things are going incredibly well. financial industry, discovered Torino’s Eataly and dove in headfirst. With half of Manhattan’s real estate underwater in 2010, the Saper brothers partnered with Farinetti (and his son, Nicola, Eataly USA’s CEO) and scored the enormous space kitty-corner from the Flatiron Building—a venture that, Saper admits, would be an act of lunacy in today’s rental market. While both Saper and Batali point out that Eataly has something for everyone at every price range—you can go to the ever-changing rooftop restaurant for a pricey dinner or stop in quickly for a two-buck focaccia at lunch—a full shopping trip is going to leave a sizeable dent in your bank account. Eataly’s prices tend to fly in the face of the prevailing “Trader Joe’s” and “cheaper price is just one click a way” trends in retail. By creating a sensory-packed shopping experience with high-quality products, Eataly has managed to substantially raise consumer willingness-to-pay—akin to other outlier companies like Apple—with superb results. When the store was launched in 2010, the partners, according to Saper, expected to do about $35 million in revenue for the year—the tally ended up nearly double that. Today, as Batali stated, Eataly is on the list of must-see New York attractions alongside the Met, Ellis Island and the Statue of Liberty; and it’s not yet a decade old. 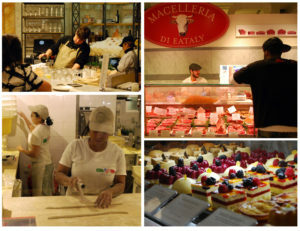 What makes the success even more impressive is that Eataly spends very little on marketing. 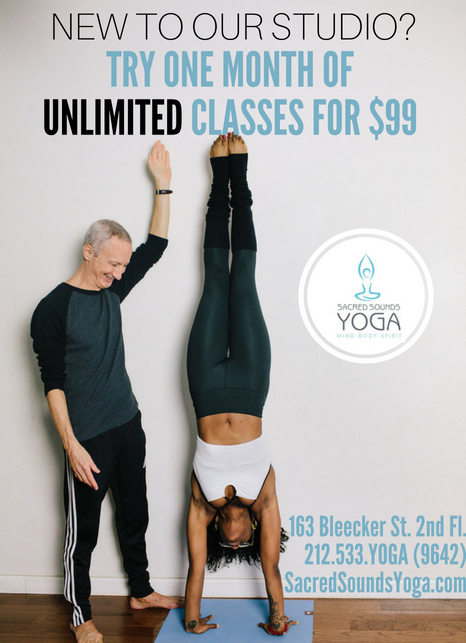 You won’t find billboards plastered in Penn Station, ads on television or banners in the New York Times; the company relies on quality and old-fashion word-of-mouth (and a photo-friendly policy) to bring in the massive daily crowds. As Eataly moves toward year seven in the U.S., there doesn’t appear to be any slowing its momentum. New stores are set to open downtown at the World Trade Center as well as Boston and Los Angeles (the Eataly in Chicago is already flying high). It would appear Eataly has tapped into a crucial solution to the panic consuming brick-and-mortar. They’ve actually made shopping a fun and exciting experience again. That’s not to say that Eataly’s partners aren’t eyeing e-commerce as well. Saper and Batali both discussed the potential of a fluid e-commerce/brick-and-mortar hybrid for Eataly. The company is already testing one-click delivery with Amazon Prime in Manhattan; but it’s the business models created by online retailers like Blue Apron, which deliver ready-to-cook meals directly to your door, that have Eataly’s attention. (Try to keep from salivating at thought of all the ingredients for tonight’s bucatini alla carbonara landing on your doorstep along with cooking instructions penned by another Eataly partner, Lidia Bastianich). From the glowing presentations by both Saper and Batali, it was hard not to be impressed with what Eataly has accomplished as well as the success both have experienced in what is a treacherous business. When asked about how he’s managed to make it in the food industry, Batali smiled and replied, “You don’t have to make all the money yourself.” The two components that matter the most, he said, are product and talent. “People don’t see the value of human hands,” he said, but when it comes to developing talented employees he’s always willing to take a shot on new recruits, knowing full well that talented hands can be earned, “no matter where they are, if they stay with us, work hard, are thoughtful and go further than what’s required, they will float to the top,” he says. In the end, Batali imparted the class with a couple no-holds-barred words of wisdom for every entrepreneur, “the worst thing to be,” he said, “is afraid of a setback or failure; but sh*t has to fail.” Eataly, it would seem, has very little to worry about in that regard.